Meyer Werft has set Tuesday (February 26, 2012) as the date Norwegian Breakaway will be undocked and towed out of the covered building dock at their Papenburg yard. After tests in the lagoon, the ship will remain at the finishing dock until its conveyance down the Ems River to the sea in early March. 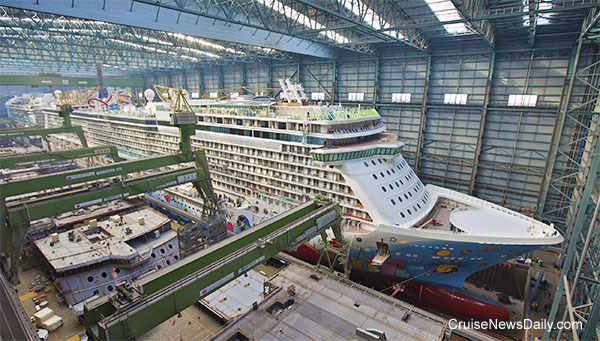 Norwegian Breakaway is shown here in the covered drydock this week looking like she's ready for her debut. When Mein Schiff 3 launches in May 2014, one of its signature features will make it instantly recognizable. On its stern, made of almost 1,800-square-feet of glass, it will have a multi-faceted diamond structure housing four restaurants and lounges as shown in the artist's renderings below. 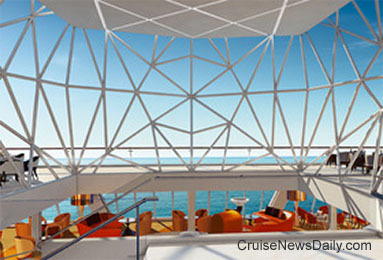 The complete story appeared in the February 21, 2013, edition of Cruise News Daily. What Freestyle allows passengers to do is create their own custom soft drinks, most of which they'll never find on their grocer's shelves. They choose a first-level Coke product from Coke, Diet Coke, Coke Zero, Caffeine-Free Diet Coke, Sprite, Sprite Zero, Fanta, Fanta Zero, Minute Maid Lemonade, Minute Maid Light, Dasani, Dasani Sensations, Powerade, Powerade Zero, Hi-C, Barq's, Diet Barq's and Seagram's Lemon Lime Seltzer. Then there are various permutations of flavoring options, such as with lemon, cherry, lime, vanilla, etc. Of course there's more going on behind the scenes because the machine mixes the ingredients perfectly before dispensing it. Use of the machine is included in the line's Unlimited Fountain Soda Package, so you can try out all 100+ beverages until you find your favorite. (The Freestyle machine thus makes Royal Caribbean's soda package unique, because no other cruise line has the Freestyle machines.) Just don't get addicted to Peach Sprite, because you can't get it from any other consumer channel than a Coke Freestyle machine.